Chemical reactions of reducing agents in the gold nanoparticle (AuNP) formation process were characterized using surface-assisted laser desorption/ionization mass spectrometry (SALDI-MS). As the reaction of the AuNPs progresses, the produced AuNPs can serve as an efficient SALDI substrate. 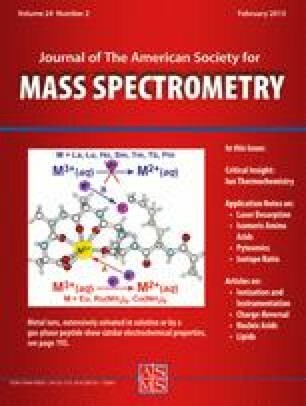 SALDI-MS revealed that the reducing agents and their oxidation products can be determined in the mass spectra. With respect to the transmission electron microscopic and UV-Vis spectroscopic examination of AuNPs, SALDI-MS results confirm not only the tendency toward AuNPs formation, but also reflect the information of the redox reaction process. Our results provide useful information for developing SALDI-MS methods to explore the chemical information regarding the surface behavior between adsorbates and nanomaterials. The online version of this article (doi: 10.1007/s13361-012-0541-5) contains supplementary material, which is available to authorized users. This study was supported by the Czech Science Foundation P206/10/J012 and the Ministry of Education, Youth, and Sports of the Czech Republic CZ.1.05/1.1.00/02.0068, and the National Science Council of Taiwan under contracts NSC 101-2113-M-002-002-MY3 and NSC 99-2923-M-002-004-MY3. I.T. is supported by Brno City Municipality Scholarships for Talented Ph.D. Students.